Home > Is your plan’s return-seeking portfolio built for what comes next? Is your plan’s return-seeking portfolio built for what comes next? Many corporate pensions limit their return-seeking assets to traditional equities. But what happens when the market environment is unfavorable for this asset class? 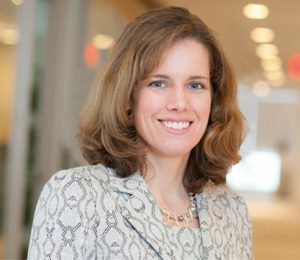 We think plans need to examine this vulnerability and consider constructing return-seeking portfolios with three building blocks that may help pursue funded-ratio growth while mitigating funded-ratio drawdowns in more challenging environments. The polar opposite of that scenario is in the bottom-left quadrant, where falling equity returns and falling rates come together in a PERFECT STORM that can threaten major funded status drawdowns. In the other two scenarios, equity returns and interest rates move in opposite directions — or to put it another way, equities and liabilities move in the same direction. In these environments, the effect on funded status depends on whether equities or liabilities experience the greater magnitude of change. One conclusion might be that plans would be best served by eliminating or significantly reducing their equity risk and fully hedging their liabilities, thereby stabilizing their funded ratios across all environments. But while that is the ultimate goal of many plans, particularly those that have implemented derisking glidepaths, it might be unrealistic at this stage for those that remain underfunded and in need of investment returns to help improve their funded ratios. For such plans, we see a compelling argument for broadening the universe of return-seeking assets with three building blocks. 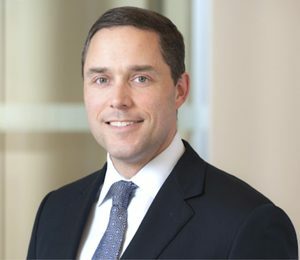 We think plans can mitigate the risk of environments that are less favorable to traditional equities — particularly PERFECT STORM environments, which can do the most damage — by diversifying their return-seeking portfolios with “bridge strategies.” These investments may play a dual role of providing potential downside mitigation in times of funded-ratio stress while still participating in up markets and contributing to funded-ratio growth in fair-weather environments. Specifically, we define bridge strategies as those that combine return-seeking and liability-matching characteristics by offering lower expected equity beta and moderate interest-rate sensitivity. 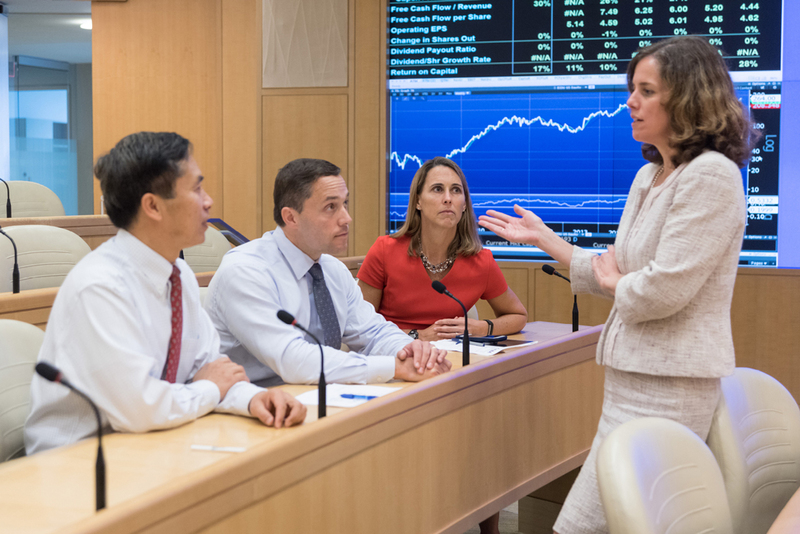 Examples include strategies focused on infrastructure investments, income-oriented equities, low-volatility equities, net-long equity investments, and fixed income credit sectors. We advocate holding a mix of bridge strategies that entail varying levels of equity beta and rate sensitivity. This diversification may help bridge strategies play their intended role across all four scenarios in Figure 1. 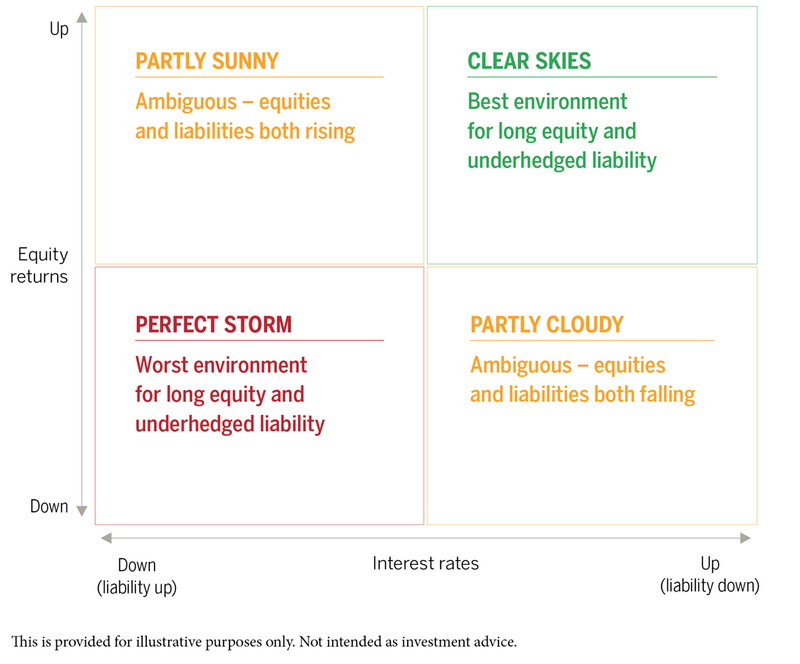 For example, in PARTLY SUNNY scenarios, liquid infrastructure investments may have enough market beta to participate in rising equity markets, and may benefit from falling rates given their interest-rate sensitivity. In PARTLY CLOUDY scenarios, unconstrained or credit-oriented fixed income strategies may be attractive for their lower equity beta, even with modest rate sensitivity. We believe absolute return strategies may play a key role in improving funded status across market environments. In particular, we think the focus should be on strategies that are structurally market neutral and therefore can potentially help bolster returns across environments. To help ensure market neutrality and the potential for consistent alpha, our team tests absolute return strategies for minimal exposure to market betas and other economic factors. Absolute return approaches can be employed in several ways. A standalone market-neutral approach may be attractive given the diversification potential of market-neutral strategies relative to traditional equities. However, a key criterion is that the expected return exceeds long-term expected liability growth. This could be a challenging hurdle for some strategies. Alternatively, a portable alpha approach can be employed to combine the active return from an absolute return strategy with desired market exposure. For example, a funded market neutral strategy can be combined with synthetic long-duration Treasury exposure, thereby matching the plan’s duration exposure and potentially generating additional excess returns. We define core return-seeking strategies as those focused primarily on funded-ratio improvement. We favor a global footprint to help maximize managers’ opportunity sets, and beta of roughly 0.9 − 1.2. While these strategies would be expected to have more equity-like performance in PERFECT STORM environments than the other building blocks we’ve discussed, this could be mitigated by seeking managers with the potential to generate alpha across market environments. In our own manager selection process, we use the market environment framework shown in Figure 1 to evaluate strategies in this context. The specific mix of these building blocks, which we think have a role to play throughout a plan’s glidepath, will depend on return objectives and risk tolerances. But the key, in our view, is taking a more holistic approach to return-seeking assets, with the objective of creating a profile that is not dependent on CLEAR SKIES for its success. This material and/or its contents are current at the time of writing and may not be reproduced or distributed in whole or in part, for any purpose, without the express written consent of Wellington Management. This material is not intended to constitute investment advice or an offer to sell, or the solicitation of an offer to purchase shares or other securities. Investors should always obtain and read an up-to-date investment services description or prospectus before deciding whether to appoint an investment manager or to invest in a fund. Any views expressed herein are those of the author(s), are based on available information, and are subject to change without notice. Individual portfolio management teams may hold different views and may make different investment decisions for different clients.